I can't believe another year has just flown by! Wednesday will mark my 2 year blogiversary. I've thoroughly enjoyed these past 12 months. It brought us some wonderful new designers, yarn companies, and indie dyers along with some of our favorite repeat guests. I have plans to bring you another great year filled with lots of yummy yarn, fresh new knitting patterns and lots of love. Keeping with tradition... I have some leftover prizes that were unclaimed to give away. 1) A comment will be chosen at random (as usual). 2) A member of our Ravelry YOTH Group will be chosen, so if you haven't joined yet, now's the time! 3) And, finally a public follower of the blog will be chosen, so make sure to sign up for that as well to get 3 chances at winning. Don't forget to tell all your knitting friends about YOTH! The more the merrier. Here's to another fantastic year. Cheers! 2. Leave a comment on this blog post by the end of Sunday, 2/12/12. What would you like to see on the blog? Or, what was your favorite giveaway this past year? I'd love to know what you like the best. Also, don't forget to join the Rav YOTH group and become a public follower on the left hand side of the blog for two extra chances at winning some lovely yarn. Hello I love reading your blog! Im looking forward to seeing more of your finished projects, your Current Cardigan is just gorgeous! thanks for these chances to win! My favorite giveaway was Cakewalk Yarns. I loved the Lacy Baktus shawl that you made out of it so I bought the yarn and started the same shawl! I've really enjoyed following your blog these past two years (can you believe I've been following since your first post?!). I think my favorite is when you post some of your own finished pieces. That yarn is wonderful - have rubbed up against it a few times! Congrats! Thanks for all the great content on the blog, as well as the giveaways. I love all the giveaways - I like to dream of winning. Plus it's a nice way to get exposed to one or two new yarns at a time. I get overwhelmed doing yarn searches on Ravelry or online shops, and can spend hours petting the yarns in my LYS. So it's nice to see just one or two at a time. Wow- thanks for such a lovely giveaway. That yarn looks SPECTACULAR! I like to read posts about yarn dyers/sellers and their businesses. I really enjoy hearing about all aspects of it...dyeing, color theory, yarn selection, operating the business. It's not something I would ever dream of doing myself...but I find it fascinating. I also like to read reviews of yarns from those who have used them. Happy Blogaversary! I would love some Mad Tosh Tart. I love learning about new yarn lines and dyers! There are so many talented artists who supply us with pretty yarn. My fave was definitely that scrumptious Madelinetosh, so I'm thrilled to see it again! Happy blogiversary! I'm a pretty new follower so I don't think I could pick a favorite yet. My favorite giveaway this year was Tanis. Their Mallard colorway is so stunning! Happy blogiversary! I love lots of things about your blog - I really love seeing your FO's - your photography is beautiful, and they are always very inspiring to me! Wow. That mad tosh yarn looks yummy!! Thx for the chance to win! Wow, happy blogiversary! I just discovered your blog this past year and have loved the yarn features, interviews, & giveaways of course. The MT giveaway must have been before I started reading the blog, but that would have been my fave giveaway for sure. Ooh, second blogiversary, so cotton? (Or china, if you prefer the modern route.) Here's hoping there is fun cotton yarn in your future, and awesome madelinetosh in mine! I think my favorite giveaway was #73, the yak yarn, as I've never tried it. But madelinetosh is one of my favorite yarns that I have tried, so it would be a close second! My favorite thing so far was the Three Irish Girls giveaway! I've never tried their yarn and would love another chance! Also, I've been wanting to try that yummy Madelinetosh (and that color is delicious!!!!)! I am a brand new follower, thanks to my friend who pointed out your blog to me. I haven't had a chance to look back through your past posts, so I'm not able to comment on my favorites, but I'm looking forward to reading and entering your wonderful giveaways! Thank you for offering them! I think my favorite giveaway was Sosae Caetano...'cause I just discovered her stuff and it is gooorgeous! Happy Blogiversary! That Madelinetosh is making me DROOL!!!! My favorite giveaway was Stephen's Westknits Book Three. I love the pictures you post. I would love to see pattern roundups on the blog! I always get so much inspiration from the blogs I follow. Happy birthday YOTH! I love being introduced to indie dyers that I might not hear about otherwise. Happy Blogiversary :) It's always exciting having a chance to win. Oh, how generous of you to give away unclaimed yarn, V. I love reading your interviews with yarnies and designers. Happy Blogday. It's truly the best. Wishes you many more celebrations. Happy Blogiversary! I had to take a break from following, but now I am back. I just want to see more of what I have been missing out on. I can't believe the Madeline Tosh was not claimed. I am keeping my fingers crossed this 2nd time around. I liked Tosh giveaway and the Skein yarns giveaway (I already own some and it's wonderful)! I love your blog! And was a lucky recipient of a prize this year. (I haven't decided what to do with it yet, but when I do I promise pics for the group!) I enjoy pretty much anything, whether it is yarn or patterns or both together! Keep up the good work! Honestly, I just love the chance to browse shops I never would have discovered without the giveaways. That is some nice yarn. Count me in. I'm a big fan! I especially like interviews with designers. I also love to hear from indie dyers. I love being exposed to indie dyers and designers that I would be oblivious to otherwise, so I am looking forward to seeing more of the unknown knitting world from you! My favorite giveaway was the vice yarn I really really wanted the Sparklicious Sterling. Wow! I can't believe that Madtosh yarn didn't get claimed -- that was actually my favorite giveaway and I would LOVE to win it! I'd love to see pattern reviews on your website, including finished products. I feel like there's not quite as much of that out there as I'd like :-) Thanks for the second chance giveaways! I really liked seeing your finished projects, and reading about them. I also liked reading about different types of fiber, like bison. Happy 2nd birthday, and here's to many happy years to come! Congratulations! I've really enjoyed reading your blog. Your finished object pics are great and I also like reading the interviews you post occasionally. Thanks a bunch!! I'd love to see yarn and book reviews; love seeing finished objects too. Thanks so much for what you bring to the blogging and fiber arts world! I really enjoy your blog. There is always so much eye candy, thanks to all your great photos of your FOs, and of course all the yummy yarn! My favourite giveaway was #62: yarn from Springtree Road. 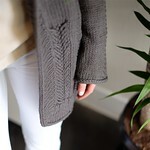 I enjoyed reading the interview with Maya, and her yarns are gorgeous! Happy 2nd blogaversary!! Hi! I love your blog! Fantastik pfotos, great diveaways and pojects! I've just love the blog, it's so inspirational. Many blessings! Lots of nice yarn this year - thank you for doing this! And that red Madelinetosh.... Best so far! Love the blog! Yarn reviews and interviews with indie dyers are great! Yooohooo, I love your "leftover giveaways"! I think the Tosh was my most lusted-after giveaway because, well...sweater quantity! Tosh! But I've really enjoyed discovering smaller dyers through the blog as well. Researching Skein colorways for the the last giveaway was dangerous. Happy anniversary. Congratulations on two years. I found the blog about three or four months ago and have enjoyed reading. Love your blog. I think it is time I won again!!! I love all your giveaways as they always introduce me to new and different yarns. I love learning about a new designer and yarn every two weeks! I would love to see more designers who have great ideas, but are just starting out - We might not know their names, but we'll love their patterns. And the same with the yarn. I love meeting those indi dyers who make the best colors but I don't know who they are yet. Happy blog anniversary! I really enjoy the interviews you do with the designers (especially the video ones). I also just like seeing the knits you create from the designers you showcase. Thanks for taking the time to share your talent. I love Madeline Tosh! In almost every shade. I follow your blog since last year and I'm going to sign up for YOTH group on Ravelry. Your pics are great and inspiring. I love to get to armchair shop the indies and drool all over my computer screen. My my favorite giveaways are patterns paired with yarn as I am always searching for the perfect project for a yarn. I've subscribed to your blog for quite some time, and my favorite parts are the giveaways! 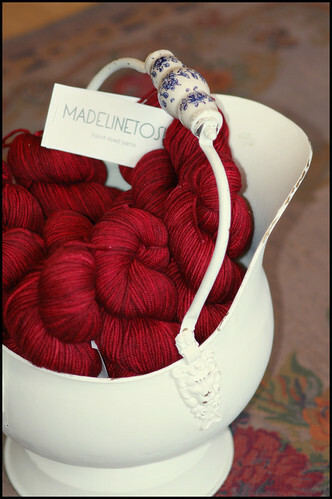 :) I would love to win the Madelinetosh yarn. It looks lovely. What's not to love here? The yarns are beautiful, the patterns inspirational, and the giveaways generous. I just wish I had more time to knit, or could knit faster! Keep up the good work Ve, and thanks! I enjoy reading about the different yarns available, particularly from small independants with something different to offer that I may not have noticed without this blog. I really enjoy hearing about yarn lines/dyers that I've never heard of before! I like hearing about little known yarns or just new to me yarns. Gorgeous Madtosh! Who would leave MadTosh or Bijou unclaimed??? That's just insane. I think my favorite giveaway was the Coastal Knits book. I recently bought the book and keep swooning over it. I am so in love with the Rustling Leaves Beret that I purchased the exact yarn used in the book so I could recreate it. In years of knitting, I've never wanted to do that before. Miss Snow was a favorite of mine and all those giveaways are super too. I'm going to have to agree that whomever left those unclaimed is plum off their rocker! They're beautiful! I enjoy pattern giveaways/ features. Of course I love the yarn giveaways! They're my main love, but I do like getting to know new designers. All the giveaways area great, but I also love to read about and would love to read even more about the indie designers/yarns you come across. I think just about every giveaway was my favorite. I love it when you post your own knitting projects and credit the models. It has been so fun to read this blog, the photography is stunning, the knits...to die for, and the yarn just makes me gush!! Thanks for all the hard work you put into everything~ it shows. Happy blogiversary! Your blog has been so much fun and I love seeing all the different yarn/dyers you profile. My favorite this year is the madtosh - and I'm stunned no one has claimed it! (crazypants!!) I also really enjoyed it when you featured Lizzy and her Vice yarns. I would like to be able to participate in one of the KALs one of these days. It is hard to pick a favorite giveaway because they have all been pretty fantastic. Madelinetosh and Bijou Basin - two of my favorites! I'd love to see more about indie dyers... blogs are an invaluable resource for learning more about yarn the world over! Thanks for the giveaway, looks scrumptious! I have to say I love seeing the yarn combinations with the patterns. Nothing makes me want to knit something more than having a great yarn to pair it with! I have enjoyed all the posts in the last year, keep it up! i look forward to seeing more fo's of yours. they're always inspiring and lovely. For the blog, feel free to show more WIPS and FOs! Love seeing those! Oh it's hard to imagine what I'd like to see more of! Your blog always shows me new yarn and gets me thinking of projects I wouldn't have dreamed up before. That's what I love about it! I just love when you giveaway the skeins of gorgeous yarns! They all look so lovely and I just hope I win some, one day. Happy blogrthday!! I can't believe that tart madtosh wasn't claimed. I love everything you post, getting to know new dyers and seeing your FOs is always fun. Those poor unclaimed pretties. I'm sure they'll find a great home this time around. There have been so many great giveaways this past year it's impossible to choose one. But the best part is discovering new things, be it patterns, designers or yarn. I love seeing your WIP's and FO's in posts. I usually end up adding a few patterns to my Rav Queue. My fav giveaway was the Tanis Fiber Arts Giveaway #64. I liked the web interview and I do love TFA yarns. Wow! Two years already? It seems like just yesterday. That Tosh yarn is gorgeous! How lucky for us that someone forgot to claim it! Happy Blogiversary! I love hearing about indie dyers I haven't heard of (fantastic enabling!) I also love your FOs - your pictures are always so stunning! Anything Madelinetosh is on my favorite list. I also love to see any yarn made in the USA since my New Years resolution is to only buy yarn made in the US. Thanks for all your lovely giveaways. I love all your giveaways especially the ones from Stephen West. I just wish I could win one. I tried to follow you publicly but got error messages... will try again. I am new to your blog so I don't have a favourite in the past year - but I have enjoyed the couple of FO posts I've read and the photo I just saw of that red Tosh yarn was pretty awesome - I'd love to add that to my stash! I love love your blog! I would love to win a beautiful prize! Congrats on 2 years as a great knitter/yarn blogger! Wow! I'd love to have Tosh in Tart - what an amazing color. I also liked when you had Dani from Sunshine Yarns. Thanks! Happy Blogiversary! 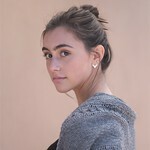 I love your blog so much. Not only do you give great visibility to indie and lesser known yarn suppliers, I also love the whole pay it forward/share the yarny love vibe. I'm already a member of your Ravelry group,and have your blog feed on my google homepage. Happy knitting! I love seeing all of your FOs. Your photographs are always so beautiful! I'd like to see more patterns in the giveaways with the yarn. It's like a two-for-one! I think the blog is awesome and you are doing a fab job! All the gorgeous yarn tempts me and tempts me! Love your Ravelray group, Wish you would show more of your work on your blog as well, although I do love the prizes. love getting ideas of things to make. Thank you for the wonderful blog. I love your project photo shoots so keep those coming. I also like being introduced to new yarns that I may not have access to in my local area. That bucket of yarn looks sooooo rich and soothing! Yummy!!!! For te blog I think I'd loke to see more crochet projects. Congratulations on your 2nd blogiversary. I think I been following you almost the whole time. I am also a member of your Ravelry group, and I have commented on this post. I have 3 chances to win one of the wonderful prizes. Thank you so much. Oh, that Tart. That was the first giveaway I entered on your blog! I just drool every time I see that colorway. I love getting to read your reviews of such varied yarns, since it makes me consider something new for my projects. Happy anniversary! Please keep profiling indie and small dyers and yarn companies. I love seeing all the Indie dyers out there. Most everything is stuff I haven't heard of before, so it's great exposure to new fiber! Just found your blog, I am envious of the talent you have. I look forward to seeing more of your work. Happy Blogiversary! It blows my mind that there is unclaimed madelinetosh and bijou basin! I'm not sure I have a favorite giveaway. I enjoy seeing all of the different yarns and patterns. It's great that you can highlight all of these fabulous artists. Happy blogiversary! Those are some gorgeous prizes - if you draw my name, I won't forget to claim it! I love the fact that you offer for givaways yarns that it is difficult for me to buy in Greece! Keep going!!! Oh. My. God. What amazing giveaways. I don't know how I'd choose a favorite giveaway. Any of the yarny ones! The pattern ones and notions don't interest me as much, I guess. Firstly, Happy Blog Birthday, and congrats!!! And it goes without saying, your truly bring an extra smile to my days, I am thoroughly enjoying your blog and features, and of course your generous giveaways!!! Would love to get my hands on some of that yarn! Happy Blogiversary!!! I always enjoy my weekly visits to YOTH. Happy Bloggy Birthday! Thanks for the chance to win some yummy yummy yarn! Congratulations on your 2-year blogiversary! I've really been enjoying reading your interviews and seeing all your lovely projects pop up (I'm also a wee bit envious at your productivity). But thanks for sharing them with us. I am drooling. :-) Happy blogiversary! I like the interviews with dyers & spinners. I still haven't taken the plunge into spinning my own, so I guess I'm psyching myself up to it through your blog. I'm already following, and here's my comment. I will join the YOTH group on Rav (if I haven't already--so many groups, so little time! ), because I wanna win! I honestly love the blog just the way it is! Naturally I love the contests, but even more I love seeing the pictures of your knitted projects. Such fun to see what people are making. Congrats on your anniversary. I love to see your beautiful photography of yarn and projects. I like to read about yarn businesses both big and small. I like to read the stories more than listening or watching but some studio video tours about their yarn, how they work and operating would be cool. I really can't remember all the giveaways but I can tell you what I like best in your blog: to learn about new yarns and designers. Both of the yarns pictured are some of my favorites! Wow! Well, it'd be easy to choose my fave giveaway if I'd won one! :). But the one I wanted to win the most was the Coastal Knits book and Quince yarn. I'd love to try Quince but am terrified of ordering what I can't see in front of me first. Specifically afraid of crazy colors... My fave part of this blog is ironically not the giveaways. I love the looks at your FOs. So inspiring! My favorites so far have been Three Irish Girls and String Theory -- but I love learning about new indie dyers! I haven't been to your site in a while (crazy life got in the way) but I liked when you did the video interview with Tanis. I really enjoy listening to people talk about what they do. I also enjoy your photography. More indie dyers please, and more of your finished objects--you have a great eye for color and styling them on your lovely models! I love being introduced to yarns I wouldn't necessarily be able to find on my own, and also the patterns you feature. Congrats on 2 years! Happy Happy Birthday - I am a member of your Rav group, too. Congrats on 2 years! I loved seeing the Tanis Fiber giveaway- such gorgeous colors! Happy blogiversary! I always love reading your blog, and not just for the giveaways! here's to another year! Congratulations! Who the heck doesn't claim Tosh in Tart? I love seeing all the beautiful new yarns on your blog and can't wait to see what you come up with next! my fave giveaway was the cakewalk yarns. love the colourways! I love seeing what you're knitting and what you've knit it with! I also enjoy the exposure to indie yarn companies. Thank you! Some of my favorites have been the Cakewalk Yarns giveaway and the Skein giveaway. Oh, the yarn. How I love to drool over the new giveaways. I love the yarn, especially learning about indie dyers. Also love how you feature patterns all the time - not that I need more patterns in my queue, but how can I resist? Happy blogthday! I've really enjoyed being introduced to new dyers and yarns I haven't heard before. Some of them I've even had the chance to try :) Keep up the good work! I love seeing the pictures of all your FOs. You have a way of presenting them in just the right light and your yarn choices are amazing. Keep up the great work! I can't believe those are unclaimed prizes. They are all gorgeous! I loved the 3IG secret giveaway! Ooooh, that bucket of tosh. I love stories about the people behind the yarns, and projects that can help use up all the partial skeins I'm left with after projects. They just hang about begging for a good home. 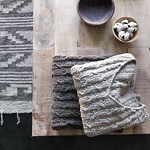 I love reading your blog, it is wonderful to see all the projects...I especially like the Tenney park pullover and the Live Oak shawlette. And for the giveaways, I liked most the Three Irish Girls One, as it was the first one for me. Happy bloganniversary to a person, who olso has a memorable babička in her life. And yes, and I am in the Ravelry group. and thank you for the opportunity to win, I am also a public follower of your blog. You're doing a great job. I like the variety of yarns & people. It's always interesting. Oh, what a fun give away! I can't begin to tell you which my favorite giveaway was; they've all been so cool. Congratulations such successful blogging! I guess I'm easy to please because I have liked all of your giveaways. I like reading about your (honest)experiences with yarns and seeing your FO's. I have been a member of your Ravelry group for a year now, and am a follower of your blog. Lovely blog; thanks for the chance to win too! I'd love to see some spinning fiber giveaways! I love your blog Ve, it's been such a great source of information! I love your interviews with Designers but my favorite post was the one about Yarnia, I had seen a few things about it before but had never really understood how it worked, now I can wait until I have the opportunity to actually go there! Wow! Unclaimed prizes! Unbelievable! I don't think I have a favourite giveaway - I love them all as it brings me into touch with new yarns, dyers and designers. I'd love to win! Congratulations on you second blog anniversary. I just like seeing all the different yarns that are available. I love this blog! And the only thing I can think of that would make it even cooler would be to add short Q&A's from either the yarn or the pattern sponsor for the week. Happy Blogaversary! 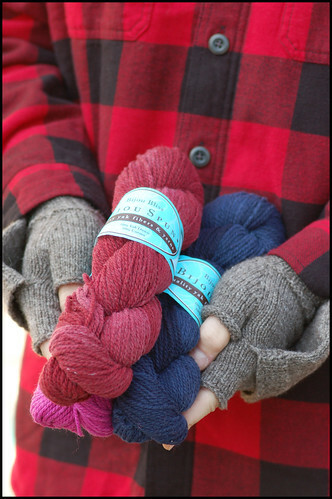 I love hearing about new yarns from your blog, and the opportunity to win and try them myself! Thanks so much! happy blogiversary! I have been checking your blog out for a good chunk of time now! I really just love seeing what is out there in fiber fun, learning more about the designers and how they got into the biz! I really love looking at and hearing about all the smaller and indie yarns. So beautiful and smooshy. Congratulations on another Blog Birthday!! What I would love to see on the blog is of course "the winner is" followed by my name! But that aside, what I really like to read is the interviews with dyers and 'knitting professionals'. It is always nice to read what ispires them to make a special yarn or pattern. I really enjoy your blog - great information, love photos of knitting and wonderful giveaways. I think the Stephen West giveaway was a favorite. Thank-you for a chance! What I love about your blog is that you introduce me to new yarn / patterns / designers. I have you to thank (or blame) for my ever-growing list of favorites and to-dos! I love your blog, and was lucky enough to be a winner last year! Happy Blogiversary and I can't wait to see what the new year brings! I really can't pick a favorite from the past year because every new prize is my favorite! More handspun and handdyed-- I'm not picky! Happy Anniversary. Hmm, favorites. I truly can't pick one and I hope these are from the last year. I think of three: discovering Anzula, Cakewalk Yarns, and Sunshine Yarns. I agree with others that I love seeing your projects in the various yarns. Inspiring. Happy birthday! I'd love to see lots more of the same - you're doing a great job! Happy blogversary! :) I generally like the blog's content, and I think all the giveaways have been lovely. It's a great way to learn about new yarn vendors. Keep it up! I love all your giveaways - but one thing I would like to see here as spring and summer approaches is some wool/silk yarn! Happy Blogoversary! I couldn't decide what was my favorite thing this year, so here are some yarns on my to-try list that I don't think I've seen: Renaissance Dyeing, Neighborhood Fiber Co., Great Northern Yarns...I could go on, but don't we all have endless to-try lists! HI! Congrats on 2 years...I can barely make a week with blogging. lol. I would like to see more Shawls. For some reason a lot of my family is dying for me to make one for them. I also think maybe someone who can explain a little how to...(how to design your own). I'd love to see an interview with Lee Meredith--her designs are so fun and inspiring! Or an interview with Alexandra Tinsley--she makes unique, cute hat designs. I have been foloowing your blog for quite a while now and really enjoy it when you highlight designers I might not normally come across. Keep up the good work. I love your blog ! The pictures are beautiful and I am looking forward to seeing more of your finished projects. Happy Anniversary on two years and counting ! Happy Birthday Blog!!!! Thanks for the opportunity to win such great yarn! i love your blog, both the giveaways and all the lovely finished projects/designs that you post! I'd love to see more WIPs from you. Your finished projects look so magical, it would be lovely to see a bit of your process! thanks for sharing. i love tosh! Love the blog. One of my favorite things is seeing what you've knit up. I see lots of patterns that I hadn't heard of. It's a great way to be inspired. Congratulations! I love to see the pictures of the finished projects and the generous giveaways of course. I don't want you to change a thing! There are so many great yarns/patterns featured, but Steven West does stand out in my mind. I wouldn't change anything. Your blog is one of the few I love to read! Happy Birthday! I love the blog. I would like to see some needles or other geer for knitting. Of course, I love the yarn give-aways. I enjoy finding out about new yarns as well as new patterns from your blogs reports.